Everyone is not your customer. Would you agree? I hope so. There are people we are best able to serve…and then there’s everybody else. A LOT of everybody else. So we have to take aim. We need to pro-actively define our target market, our target customers. Hopefully, you’ve come to a clear definition of your domain of expertise – that is, those broad areas of the marketplace where you have solid knowledge, expertise, and contacts. Let’s say, for a moment, that your domain is Financial Services. Let’s further narrow it down to Banking. Is that narrow enough to gain you solid referrals into targeted potential clients? Not on your life! How many divisions, sub-specialties, locations, and sizes of banks are there? It doesn’t help anyone to refer George to an investment banker in Canada, when he provides technology support services for automated bank branches in New England. So now you want to more precisely define your target customers – your sweet spot. And you do this by pigeonholing yourself. Yes, you read that right. Embrace the pigeonhole. Define it for me! Tell me not only exactly what you do, but also for whom you do it, and where I can find them. Here’s the reality of business – each of us as professionals, and all of our companies, WILL BE pigeonholed. It is human nature to try to categorize people and companies so that we can maintain some sort of order in our memories. So, since people will put us in a box (or hexagon) in their minds anyway – shouldn’t we go ahead and describe exactly what box is our sweet spot? We’re either going to occupy some space in the minds of customers, or we’ll occupy no space. Therefore, it’s better to clearly define our sweet spot and make that message abundantly memorable. I want to be pigeonholed (accurately). Because that’s when customers know to call me. That’s when people know how/when to refer me. There’s a certain business size, location, and situation where Brian is going to add most value. Now, yes, this pigeonholes him – so he won’t be referred into, say Ford Motor Company in Detroit for CFO services. But that’s the point – Ford doesn’t need a Brian Eytchison, and Brian isn’t a good match for Ford! They fall into the “everybody else” category for Brian (though some division of Ford may be right in the sweet spot for someone else). My challenge to you today is to pigeonhole yourself. Actually narrow down who your target buyer is – even including title and role if that is relevant. The less time you spend spinning your wheels chasing business that’s not a match for you, the more time you’ll invest in building value with your true target customers. Need to define your goals and direction? I’ll help you get clarity. 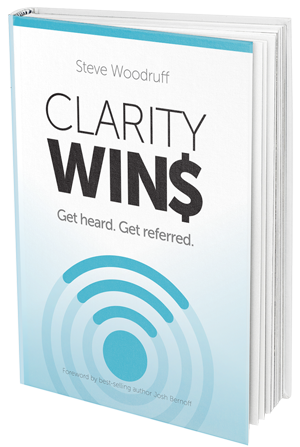 And, while you’re thinking about getting clear, go ahead and subscribe to the weekly Clarity Blend e-newsletter here.